“What if your party decides to invite you again?’ I probed deeper. “Are you not aware that our Party has zoned the Presidency to the North, and the Chairmanship to the South?” he queried. I gave him my permutations but he insisted that the two major Parties are highly inclined to produce candidates from the North. 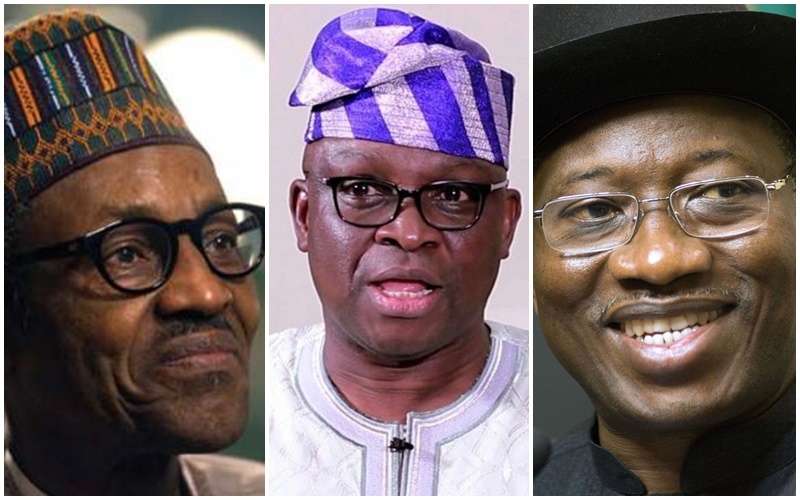 “Even Fayose that has declared his interest may face big challenges because of the decision of our party…” he opined. “So there is no way you can ever contest again?” I fired again and he returned the fire instantaneously, “I’m not God but I sincerely doubt the possibility…” he said with finality. I dropped the subject as it was not my intention to put him on the spot, like that. “How will you rate the Buhari government so far?” another tricky question, I felt. “What do you think Dele?… You are their friend…” I kept mute “Honestly speaking, they have tried in the area of security and fighting corruption, even if they’ve tilted more towards us… But we did a lot in our time in the area of agriculture, transport, managing the economy, rule of law, free and fair elections… Only Nigerians can judge… It won’t be fair of me to pass verdict so soon on my immediate successor… I knew they would hit brick-walls on some of their promises, especially the school feeding program and the payment of N5,000 to unemployed graduates… We worked on feasibility studies on them in the past and realised Nigeria could not afford it… It is always the job of opposition to over-promise but reality of governance is always different…”, he said, animatedly. I could see and feel this was his forte. He spoke confidently and eloquently about the art and science of governance. He said the figures are still fresh in his memories. I decided to digress again. What does he think about Alhaji Atiku Abubakar’s chances. “He can’t get the APC ticket. If Atiku gets our party ticket, he would compete well. He’s always a passionate politician. But he would have to reach out to our boss, Baba OBJ, the boss of all bosses. We’ve all learnt at different times that you ignore OBJ at your own peril. OBJ has the magic wand, respected at home and abroad…” speaking like a penitent student. Experience, they say, is the best teacher. If PDP picks a Northern candidate, where does he expect the running mate to come from, I asked. “Strategically, since Professor Osinbajo is already running with Buhari, the South South and South East, remain the most fertile grounds. And there are many brilliant people there waiting for the chance. The Governors control some of the richest states in Nigeria except Lagos…” he posited.